This spacious wine cellar is ideal for those with a mid-sized collection as it can comfortably store and chill up to 38 bottles of your favorite brands. The contemporary freestanding unit provides 4.03 cubic feet (114 liters) of chilling space which can keep your collection anywhere between 39°F and 64°F (4ºC and 18ºC) via the electronic blue-LED thermostat. This sophisticated appliance adds a touch of class to any setting due to the black cabinet and stainless-steel trimmed door frame and handle. The interior is just as elegant as it features stainless-steel trimmed black wood shelves to match the exterior. Your bottles can be showcased via the attractive interior blue LED-lighting system and can be protected by the clever integrated door lock system. 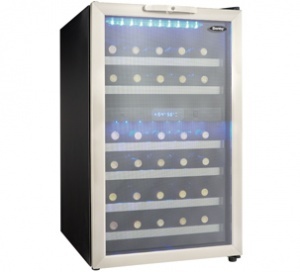 This innovative wine cellar offers a reversible door hinge which can be adjusted for either left or right-handed opening and also has a 12-month warranty on parts and labor with convenient in-home service.